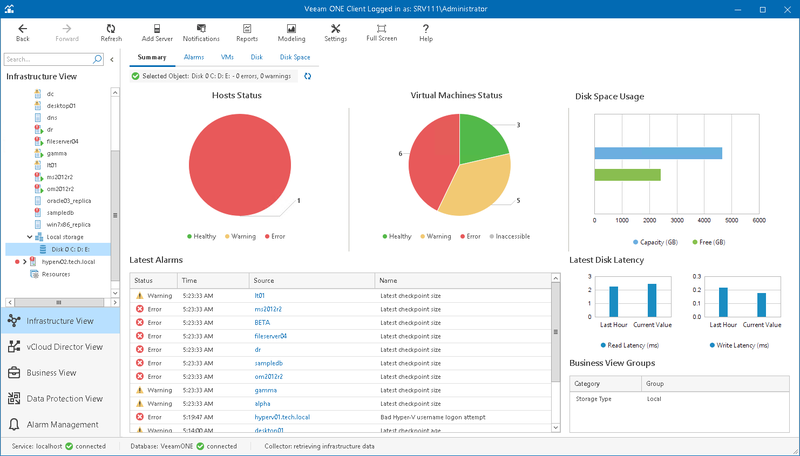 The local storage summary dashboard provides the health state and performance overview for the selected host local storage. In addition, it shows the state of objects that can affect the storage performance — the parent host and VMs on the local storage. The charts reflect the health state of the host and VMs that work with the local storage. Every chart segment represents the number of objects in a certain state — objects with errors (red), objects with warnings (yellow) and healthy objects (green). Click a chart segment or a legend label to drill down to the list of alarms with the corresponding status for hosts or VMs. The chart reflects the amount of available and used disk space on the local storage. The list displays the latest 15 for the local storage and objects that work with the local storage. Click a link in the Source column to drill down to the list of alarms for the selected object. The section displays the current read and write latency values as well as the average latency values for the past hour. For more information on working with triggered alarms, see Working with Triggered Alarms.